Mukhtar Qasim Ali trekked for 90 kilometres to seek refuge in Galkayo as an IDP after his family lost their entire source of livelihood to the drought that devastated most parts of Somalia in 2016. Before coming to Galkayo, Mukhtar was working in a tea-shop; work he started at the age of 15 in order to provide for his 8 siblings of whom he is the eldest. Having been born in a pastoralist family, Mukhtar never had the chance to attend school and spent his childhood looking after his family’s livestock before the drought struck. 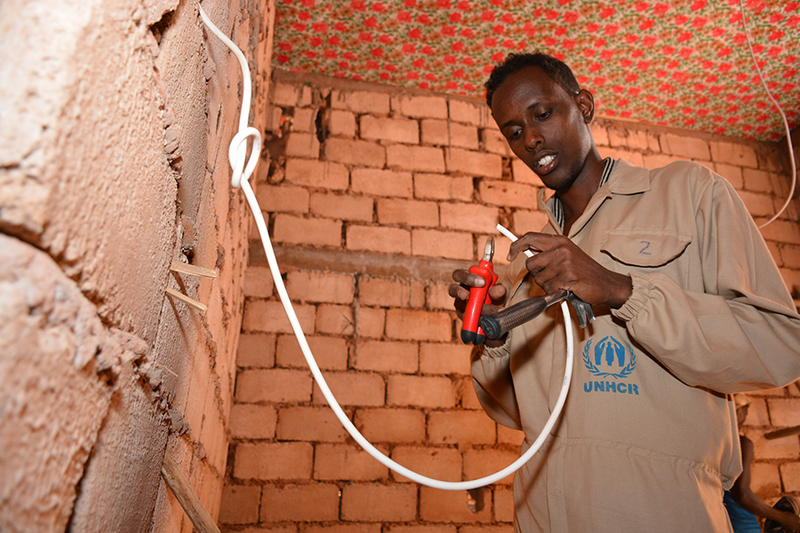 Assuming the status of an IDP while in Galkayo, he was lucky to be selected among 24 other IDP boys for a 6-month Electrical Installation and Wiring Course, under a livelihood project conducted by GECPD with funding from UNHCR-Somalia. After graduating from the course in October 2018 and having been awarded with a start-up tool-kit to boost his acquired skill in earning a decent livelihood, Mukhtar is now offering freelance Electrical Wiring and Installation services in the community. This has improved his life evidenced by his relocation from an IDP settlement to rented house in town which he says he can comfortably afford. “I’m grateful to GECPD for making me whom I am. This course has really changed my life and given me hope…….now I have a skill and can now live my life.” He says. “Can you imagine this tester -small as it looks- pays all my bills?” he adds amid chuckles as he shows off his electrical installation tool. With 70 per cent of the population in Somalia under the age of 30 lacking employable skills, vocational training and job creation for the youth has remains one of the biggest challenges the country has to deal with. Decades of instability due to conflict and environmental calamities have resulted into widespread poverty and a sense of hopelessness amongst the young generation posing an imminent danger to the country’s security. 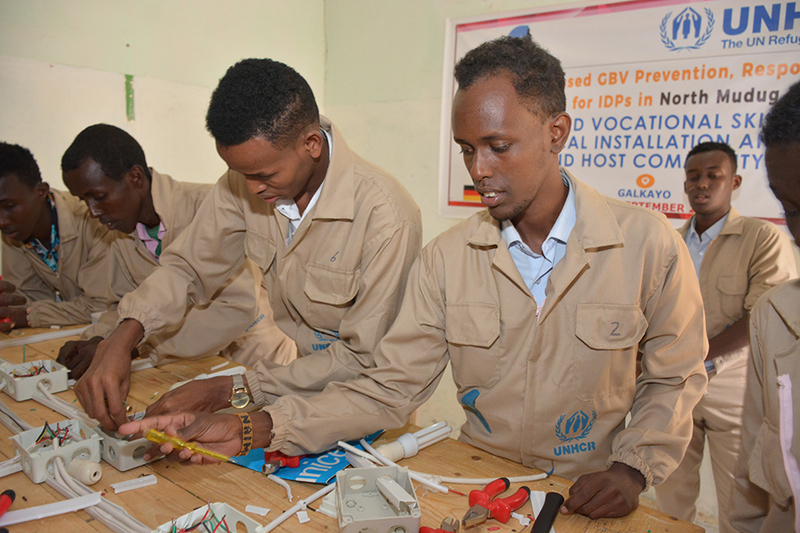 GECPD is working with UNHCR and other donors to provide marketable vocational skills targeting IDPs and poor host community members in Galkayo. In 2018 alone, 78 young men and women graduated with skills in Catering and Hospitality Management, Niche Tailoring and Electrical Installation and Wiring Courses. Besides enabling them to earn a decent living, this courses have helped reduce the vulnerability of this population to protection concerns such as GBV.